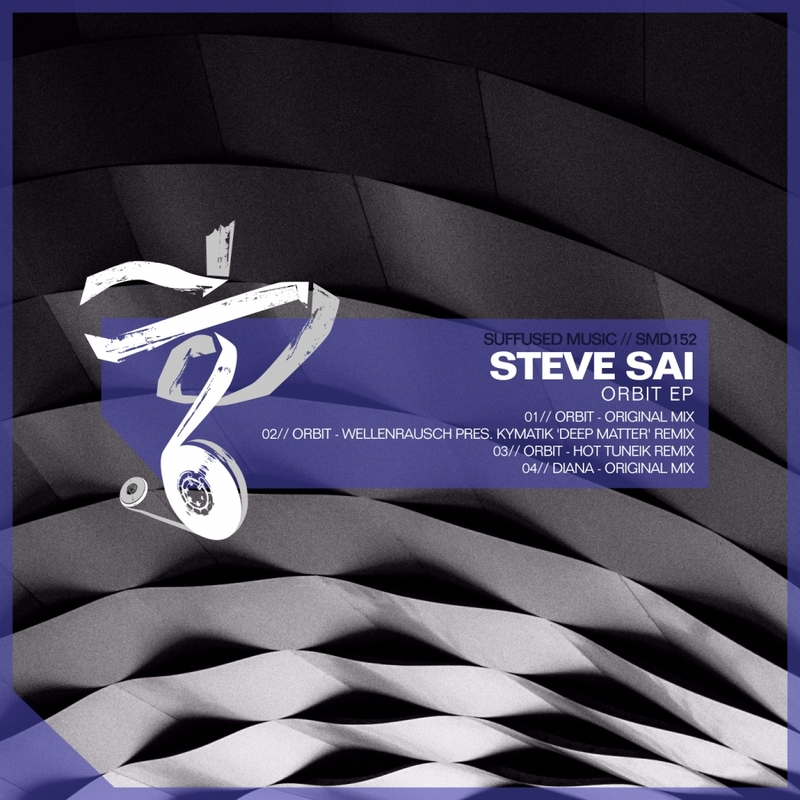 The latest release on Suffused Music welcomes Steve Sai back to the label for a brand new single. The Greek artist last appeared on the Lithuanian imprint with his ‘When The Lights Went Out’ single which was released in 2014 October. Now making his sixth overall appearance Steve presents his brand new two track EP entitled ‘Orbit’ alongside remixes from Wellenrausch pres. Kymatik and Hot TuneiK. Steve’s tenure in the electronic underground stretches back over 15 years. A DJ from the beginning the Greek artist has shared the decks with a broad range of A-list talent including Max Cooper, Minilogue, Dave Seaman and Oxia. His understanding of dance floor dynamics is something that has always translated into his original music much like the lead piece here ‘Orbit’. Beginning with a techno inspired groove the piece builds a smooth, hypnotic sensibility early. Layered beats and clustered claps set the stage for acid motifs and haunting vocal elements. Stripping down into the break the atmospheric tension builds as the effects decay before a timely build delivers that perfect dance floor payoff. The first interpretation of ‘Orbit’ is provided by Wellenrausch pres. Kymatik who are making their third appearance on the label. After debuting the new moniker earlier this year the Berlin based duo have impressed both their fans and contemporaries alike. Their modern approach to the progressive blueprint is fresh and the underground is taking notice. Here they twist ‘Orbit’ into a mesmerising journey which plays out over eight magical minutes. The buzzing energetic core of the original stays nicely intact but it’s Kymatik’s contemporary design and creative vision that shines. Wonky synth motifs make for an unpredictable and truly exhilarating ride with a more melodic third act pushing it into goosebump territory. The second and final interpretation of ‘Orbit’ is provided by Diego Carreón aka Hot TuneiK who is making his second appearance on the label. The Mexican artist and Hookah Records label boss last appeared on Suffused Music with his remix of ‘Can’t Explain the Bang’ by Andrez from September of this year. Much like Kymatik, Diego’s modern sound has been praised and Hernan Cattaneo and Nick Warren remain steadfast supporters of his music. Always looking to deliver something unique and different Hot TuneiK takes ‘Orbit’ into deeper territory with great success. Backed by a chunky groove Diego builds hypnotic layers fuelled by tough percussion and rugged synth work. Transitioning into a moment of calm the main break adds a serene balance to the dark undertone and makes for an emotive third act transition. The release concludes with a second original entitled ‘Diana’ which proves to be a great complement to ‘Orbit’. Following similar design profiles Steve takes the narrative to a darker more ominous place with paranoid motifs and rugged stabs all set against a mystical backdrop. Stellar drum fills and wispy vocals shine while an expertly executed break foreshadows a superb finale full of intertwined synths and rushes of white noise. It rounds out another top notch offering from Suffused Music in style. Don’t miss it.